It is particularly useful when your horse is recovering from an abscess, puncture or hoof separation. To use, simply mould the adhesive putty in clean hands and press into the cavity until you have a dense plug for best results. Keratex Hoof Putty is a semi-permanent wax that seals and stabilises hoof separation, plus it prevents grit, mud and debris getting jammed up into the hole and damaging the recovery process. The adhesive filling mixture also disinfects making it the perfect aid to recovery after punctures, abscesses and cavities. Please note that Putty will be hard while in the tin but will soften in your hands as you mould the shape you require. 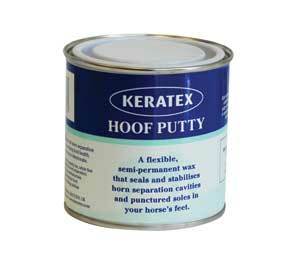 Keratex Hoof Putty is allowed by the Jockey Club and the FEI.